As we conclude another successful year at the Inn, we love to reflect on the many accomplishments we have had in both our professional and personal lives. This year, we booked a record amount of weddings, lengthened our breakfast menu and switched Mac Minis to iPads. 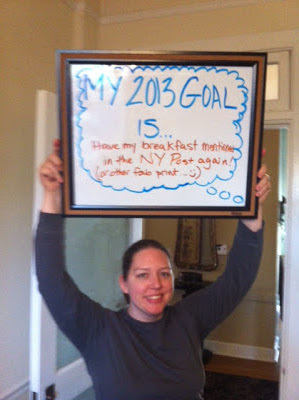 Lots of positive change at the Inn, while many of our staff members did the diet for our own personal goals. One has bulked up from weight lifting, one has conquered pilates and another is ready to tackle a marathon at the end of January! Cut back on soda, cigarettes and work out! Have my breakfast in the NY Post again (or another fab publication)! We have some great goals this year! What is on your Bucket List? Whether it is large or small, we wish you a happy New Year! 2013 is sure to be great!